Functional verification plays an important role in hardware design and verification cycle due to the increasing complexity of hardware design. The main challenging concern in functional verification is finding suitable test vectors that can provide high coverage rate. Coverage verification allows to modify the directives of the test generator and target the area of the design that are not covered. 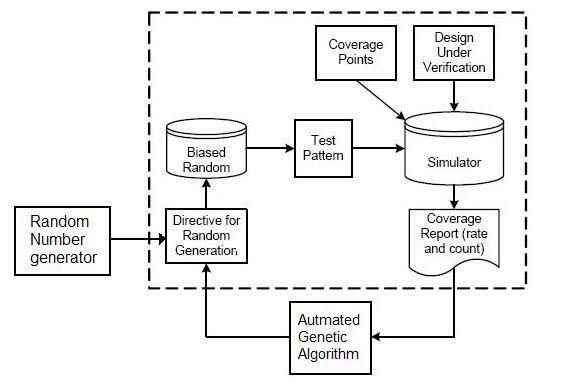 This process of adapting the directive of test generator according to feedback based on coverage report is called Coverage Directed Test Generation (CDG). CDG is manual and exhausting process but it is vital to complete the verification cycle. Attempts are made to automate the verification cycle by applying different Artificial intelligent techniques such as Bayesian network, Neural Network and Genetic Algorithm . To increase the coverage of multiple coverage points and targeting complex coverage task while achieving high coverage rate a Cell-based Genetic Algorithm (CGA) is developed to automate CDG . We propose further enhancement to CGA by using different probability distribution functions (pdf) such as Normal (Gaussian) distribution, Exponential distribution, Gamma distribution, Beta distribution and Triangle distribution for random number generator and apply the modified algorithm to more complex hardware design at the system level with large number of coverage points.